There is also a super bright LED for emergency use. 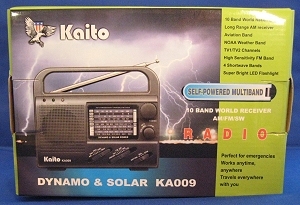 Retailing for $54.99 the KA009 offers an incredible combination of reception bands not usually available on such radios. 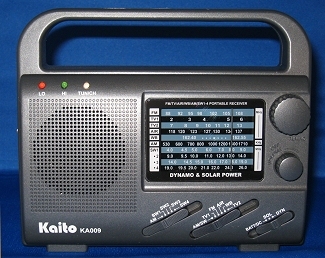 The KA009 is a smallish portable available in Black, Red or Blue measuring 6 ½” x 5 ½” x 2 ¼”, and is supplied with an AC adapter, earphone and wire antenna accessory. Other extras include 4 modes of power. Dynamo power which charges the internal NI-MH batteries, Solar power which can charge the batteries or play the radio directly, 3 AA batteries which allow you to use the radio the traditional way and of course AC power via the wall wart. There are three LED’s along the upper left edge. 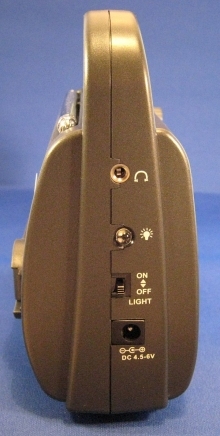 The first two, labeled “Lo” and “Hi” indicate relative charge of the built-in rechargeable battery, the third labeled Tuner/Charge is a two-color LED, turning Red when a station is properly tuned and Green when you are charging the battery by cranking. The earphone jack on the side doubles as the remote SW antenna jack. The KA009 packs a surprising number of bands and features into a small package and I’ve got to say that all features and functions worked as intended. I did not expect world-class performance on any reception bands but I was pleasantly surprised that the radio seemed to work reasonably well, bringing me solid reception of the usual, stronger signals. Some medium strength signals which are not always well-received on inexpensive radios were coming in better than I might have expected and certainly for the casual AM/FM or SW listener all your major signals will be there. I am no expert on air band signals but I heard several…I live about 10 miles from a medium-sized airport and was able to listen in with no problems. The Weather band also seemed to work well…I can receive a few of these frequencies clearly in my location and they were there on the KA009 loud and clear. I fared slightly less well on the TV1 and TV 2 bands. They seemed to be filled with local FM signals unless I shortened the telescoping rod antenna somewhat. I was able to clearly listen to my strongest local VHF TV channel, but a second channel some 35 miles distant was not to be found. Tuning around on SW at night I was able to pickup the majors with no troubles…even good old Radio Havana Cuba on 6 MHz was there and easily listenable. AM was good at night as well…the band was full of signals and I was able to separate signals on adjacent frequencies when they were approximately equal in strength. 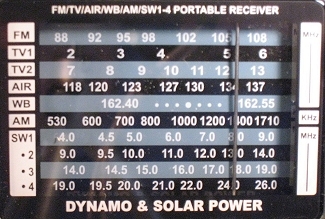 My local FM’s were ok as well…sometimes shortening the antenna helped reduce spurious images a bit…again, very typical performance in this class of radio. As with any small analog radio the dial gives only a general indication of where you are tuned, but you eventually learn where stations come in on the dial. 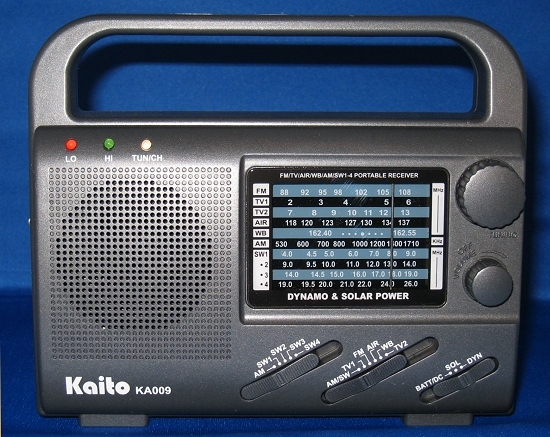 I then compared the KA009 with two older, hand-cranked emergency radios I had on hand. The KA0009 matched them on overall performance and was the clear winner with its multi-band flexibility thrown in. Some radios offer cell phone charging and that is a plus, but none that I have offers the KA009 combination of band selections and power options. With 4 power sources and 10 bands of AM/FM/SW/Air/Weather reception plus a built-in LED flashlight the KA009 stands as a great value. 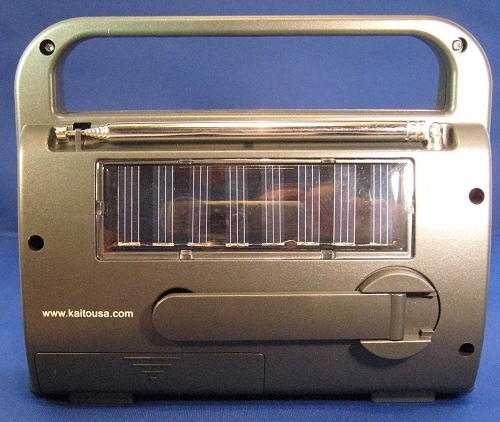 There are several variant models with fewer bands, or larger size for better sound available…visit http://www.kaitousa.com/ for details.